TerraNOVA Collective's fifth annual soloNOVA Arts Festival, featuring eight different solo performers over two weeks, opened last night at P.S. 122 in NYC. The New York debut of Kim Wayans' A Handsome Woman Retreats (a seriously funny journey to inner peace...) opened the festival. Having suffered from panic attacks for most of her life, and struggling to find her own voice and identity in the shadow of her siblings the Wayans brothers, Wayans attended a 10-day silent meditation retreat. What began as a miserable experience (that she was talked into by her yoga instructor) eventually uncovered both the source and the cure for her anxiety, and has now resulted in her first one-woman stage show. "This is my first attempt at live theatre," she says, "and I'm totally green, but it's been wonderful so far and I'm really excited. I've always had a dream of doing a one-woman show. I just didn't have the courage that goes along with it!" Wayans co-starred in the sketch comedy show In Living Color, and has maintained a career in film and television ever since, including as a writer and producer for her brother Damon's My Wife and Kids on ABC. But the experience of her meditation retreat allowed her to express her inner truth in a new way, she says. "We live in a culture where everybody is just so busy all the time, so all over the place and so external, grasping for happiness outside of themselves. Take the time to slow down, to reflect and go on that journey of self-discovery to really understand your value and the power that lies within you. Take a break. Pause. Enjoy the beauty of silence, and listen to the wisdom that silence is trying to teach you." 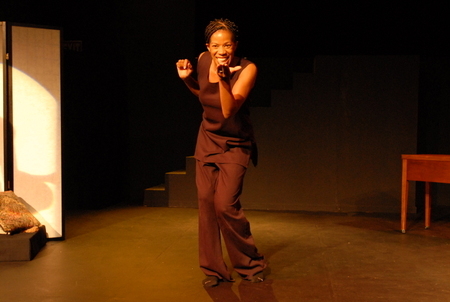 A 10-day silent retreat might seem like an odd subject for a one-woman storytelling show, but Wayans uses the experience as a framing device, letting the audience get inside her head as she reflects on her childhood and professional career in hilarious yet touching ways. After the show, Wayans admitted that she was overdue to return to the retreat, which she now does annually. Following A Handsome Woman Retreats, Eric Lockley performed his one-man show Last Laugh, a satire in which two black performers begin to confuse performance and reality. Lockley developed the show at NYU's Experimental Theatre Wing when he was still a drama student at NYU's Tisch School of the Arts last year, and performed it at New York's LaMaMa ETC. in February. The show is about the dueling --literally -- personalities that a black performer in America must balance, in order to entertain audiences without pandering or losing his sense of identity. Think Spike Lee directing The Incredible Afro-Hulk from a screenplay by Charlie Kaufman, and you get a sense of the inner transformations and character mutations that Lockley performs in his 60 minutes on stage. Having performed Last Laugh on three different New York stages over the past year, Lockley says that his next goal is to take the show to L.A. In the meantime, the 2007 NYU grad continues to develop work for The Movement Theatre Company, which he founded with fellow NYU students. "A solo artist is a different type of person," says Jennifer Darling, producing artistic director of soloNOVA. "They really are hard workers, and know how to promote themselves. There's not a lot of fear, as a general rule." The fifth annual soloNOVA Arts Festival runs until July 2 at PS 122. A Handsome Woman Retreats and Last Laugh perform June 20, 21 & 23. To read more about soloNOVA, click here.